You read about some incredible new breakthrough solution to head off heart disease, sidestep diabetes, or build a barrier against cancer. You get excited only to have your hopes dashed. It turns out you’d have to take out a second mortgage to afford it. Or even worse, it’s SO exotic you can’t even get your hands on it. Talk about a letdown. Let’s face it… breakthroughs are useless when you can’t actually use them. That’s why this new study is so exciting. It didn’t focus on some new-fangled drug. And it doesn’t hype up a natural solution from some far-off locale that you can’t even find here at home. Instead, it takes what we already know about how chronic diseases work and uses that knowledge AGAINST them. And most exciting of all is it literally will only cost you a trip to your local supermarket. And just pennies a day. It reveals how you can harness the power of free-radical scavengers. And allows you to create a kind of fortress against the oxidative damage that’s behind literally every chronic disease you, or a loved one, may face. In fact, this “chronic disease cure” could ALREADY be in your kitchen right now. Because as bizarre as it sounds, this triple threat trio is hiding a potent secret… supercharged antioxidants. All three, according to the research published in the journal Free Radicals and Antioxidants, not only can help prevent any disease caused by free radicals. They could also slow down their progression if you’re already ill. In other words, just eating MORE of them could mean FEWER prescription meds and their ugly side effects. Of course, this isn’t the first time we’ve seen these three healing foods make a splash. Their resume was already quite impressive. A study published in the Journal of Medicinal Food looked at four separate compounds in garlic and found that each targeted a different type of damaging oxidation. Which means this humble spice offers protection on four different levels. Other research has linked garlic to stronger bones, better physical endurance, and heart protection. In one study, eating raw garlic at least twice a week was associated with a 44 percent lower risk of lung cancer. And in another, researchers showed compounds in garlic are able to kill glioblastoma cells, a form of deadly brain cancer. And in a small study published in the Journal of Nutritional Biochemistry garlic extracts sent oxidation levels plummeting while it improved cholesterol and blood pressure in volunteers. Garlic is a proven free-radical scavenger. But it turns out onions may be even better at this task. When Finnish researchers did a head to head comparison between the two healing foods purple onions came out on top. The additional antioxidants in their purple skin pushed this tasty veggie over the line. Studies have found compounds in onions can also help reduce the severity of bladder infections and UTIs, support heart health, and fight against prostate cancer. The last member of our powerful trio, ginger, may be the most impressive of all. In fact, the new study found the spice had the highest free-radical-scavenging activity of the three. 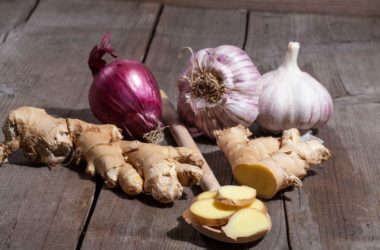 And according to a meta-analysis of 71 different studies published in the International Journal of Preventative Medicine, ginger has impressive antioxidant and anti-inflammatory powers. Other research has shown ginger to be effective against nausea, gum disease, respiratory infections, arthritis, and high blood sugar. Of course, I’ve just scratched the surface here of what this triple threat can do to keep you healthy and fight chronic diseases. And the best news of all is filling up your grocery cart with all three will only set you back around $2. No prescription or ticket to some exotic locale required.